The Britannia TV show has been renewed for a second season on Sky Atlantic, as well as Sky’s streaming service NOW TV, which services UK and Ireland. Sky Vision handles the international distribution rights — excluding the United States. The first season of Britannia was an Amazon Prime Original in the US and was the first co-production between Sky and Amazon Studios. We’ve reached out to inquire as to whether Amazon has renewed Britannia for season two, as well. When we know more, you will, too. A historical drama, the first season of Britannia on Sky Atlantic and Amazon stars Kelly Reilly, David Morrissey, Nikolaj Lie Kaas, Liana Cornell, Gershwyn Eustache Jnr, Mackenzie Crook, Barry Ward, Stanley Weber, Joe Armstrong, Fortunato Cerlino, Callie Cooke, Aaron Pierre, Eleanor Worthington-Cox, Zoë Wanamaker, Ian McDiarmid, Julian Rhind-Tutt, Hugo Speer, Daniel Caltagirone, Zaqi Ismail, and Annabel Scholey. It unfolds in 43AD, when Emperor Claudius dispatches General Aulus (Morrissey) with 400 ships bringing 20,000 men to Britain’s shores. Now, the Romans must deal with warring Cantii and Regni tribes, warrior queens, and the enigmatic Druids. Learn more about the Britannia season two renewal from this Sky press release. Viewers are set to journey back into the deep, dark and unruly world of Britannia, as a second series of the unique Sky original production is coming to Sky Atlantic and TV streaming service NOW TV next year, with filming starting in spring 2018. 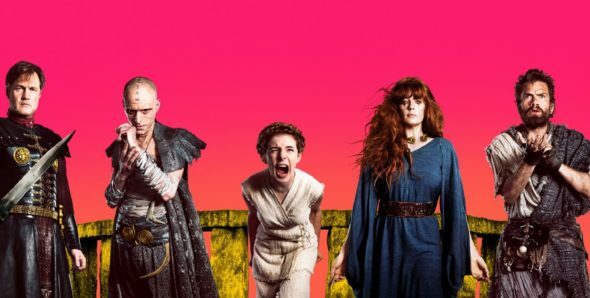 Written by multi-award winning Jez Butterworth and Tom Butterworth starring David Morrissey, Kelly Reilly, Zoë Wanamaker and Mackenzie Crook, Britannia launched earlier this year to great critical acclaim. The series was the biggest Sky original production launch on Sky Atlantic since Fortitude series 1, with the first episode watched by a cumulative audience of 1.88 million. To date, the series in total has had more than 10 million downloads and views on demand through Sky set top boxes, the Sky Go app and TV streaming service NOW TV. It’s also been the most downloaded Sky series in Ultra HD and has been sold in 206 territories worldwide. Set in 43AD, the drama followed the Roman army as they returned to crush the Celtic heart of Britannia, a mysterious land led by warrior women and powerful Druids who claim to channel the powerful forces of the underworld. Like never before, the nine-part series told the story of the emotional and physical power struggles between three tribes: the Druids, Celts and Romans, who battle for the heart of Britannia. Series two, written by Jez, Tom AND JOHN-HENRY Butterworth, will continue to explore the life of the Celts and Druids now living under Roman rule. Britannia was created by Jez Butterworth (Spectre), Tom Butterworth (Tin Star) and James Richardson (Monsters). Series two of Britannia will be written by Jez, Tom and John-Henry Butterworth. Produced by (Downton, The Hollow Crown ) and executive produced by Vertigo Films’ James Richardson (Monsters), Sam Mendes, Pippa Harris and Nicolas Brown from Neal Street Productions (Penny Dreadful) and Jez and Tom Butterworth. All nine episodes of the first series of Britannia are available to watch on Sky Atlantic and TV streaming service NOW TV. What do you think? Did you watch the first season of the Britannia TV series? Should it be cancelled or renewed for season two on Amazon? More about: Amazon TV shows: canceled or renewed?, Britannia, Britannia: canceled or renewed?, Sky Atlantic TV shows: canceled or renewed? Amazon should DEFINITELY pick up season 2! Britannia is amazing and if Amazon wants to keep its viewers happy, airing season 2 of Britannia is Definitely a way to do so! Amazon should absolutely pick up season 2, season 1 was awesome. Don’t leave us hanging Amazon! Bring back season 2 of Britannia!!! Season was was awesome! Amazon, PLEASE bring Season 2 on board for all of us who LOVE this series!!! I’ve watched it three times! It is amazing! Cancel some of the not good offerings and bring on Season 2 BRITANNIA!!!! Amazon. You cannot leave us hanging on the Britanica Series. It’s a great show. Please bring back Season 2. I just finished season 1. I loved it! I can’t wait for Season 2. Jeff Bezos, BRING IT ON! OMG I’m so bummed out! I just finished binge watching all nine episodes! Where is season two?!?! Please Amazon, I beg you to bring season two. PLEASE!!!!PLEASE!!!!PLEASE!!!! !PLEASE BRING BRITANNIA BACCK AMAZON PRIME!! I WILL RELOCATE TO THE UK JUST TO SEE THIS SHOW!!! I’M SERIOUS….MOVING MY WHOLE FAMILY!!! This was a very enjoyable series. I hope they continue with it. Many do not try to depict this era in history. This is the BEST TV show I have streamed, yet! This MUST be renewed. Please dive in to the history of the Celts, Druids and Picts. We all know the Saxons and Romans pillaged our beautiful land.